The digital universe provides countless possibilities for innovation. Whether we stretch the boundaries of mobility and cloud solutions with mobile device apps, IoT devices, or real-time enterprise applications, integrated solutions are critical to delivering a complete user experience (UX), which is one of the core principles of design thinking. 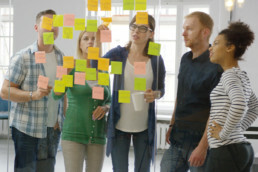 The integration principle of design thinking represents the opportunity to connect what would be otherwise restricted user interfaces (UI), disconnected touch points, and a fragmented UX. Integrating these elements means the delivery of cohesive solutions, products, or services. This approach is about discovering value in hidden corners, as much as it is delivering what may be taken for granted or appear obvious in everyday human interactions. Here are the three primary types of integration that are worth considering. Inbound integration leverages integration points—such as an originating source system, data point, or action—that are outside the current user state or UI. For example, when you install a new app or program, you can import certain things from other apps or programs. Outbound integration extends the reach of a product, solution, or service to another solution, where the target is outside the current user system, provider, experience, or application. A simple example is the social sharing feature of an app. In-play integration allows the integration point to unfold inside the current user state. It typically involves UI optimization for alerts, navigation, or data drill-down, among others. I don’t refer to this approach as “in-use integration” because it can come into play, even if the user is not in an active state, such as alerts on a locked screen. These integration points deal with the complexity of logistics and implementation. Basic integration includes features that we may take for granted in the UI or as part of the overall UX. Additionally, they require the lowest-risk scenario because of their maturity and extensive use of a vast number of applications. A simple example is the ability to call or email directly from the UI by tapping an icon. Intermediate integration involves, what I call, a “handshake” with another party, service, or system to leverage existing procedures, rules, systems, or guidelines. Furthermore, it results in a one-way or two-way exchange. The common practice of passing parameters (or characteristics of your arrived or current state) to the next step, party, service, or system is a good example. Suppose you have a hotel reservation, and you decide to accept an offer to book a sightseeing tour with a separate partner company. The new app or website remembers your previous criteria, such as dates and locations. Another example is the single sign-on authentication, which is common in corporate settings. Advanced integration is the most challenging scenario because it takes the handshake even further and allows two-way record sharing and data-set updates, including the ability to amend the systems of record. Consider a salesperson who enters a record into an ERP system. After reviewing the daily report in an analytics application, the rep quickly realizes that an update is required. Instead of going back to the source system to amend the record and wait for it to be pushed back to his report, the update can be made right in his analytics application. This method is focused on the logic that supports the decision to execute an integration point (an action) or the definition of what that task should entail. Simple logic is based on a single layer of rules. The if-then logic in programming is a great example. If X happens, then Y should happen. It does not consider any other criteria or variable. It does not tell me why or how I can remedy this situation. For example, a red light comes on when a part malfunctions. Discovery logic takes the simple logic further, but only by one step. Depending on the complexity of the system in question, it provides clues to the source of failure. It’s still not fully integrated, but I have more feedback than just a red light. For instance, the design may include multiple lights for different failure points. The red light with the bulb icon may inform me that the lightbulb is out while the red circuit light may suggest no power. In charging your laptop or mobile device, the use of different lights can indicate status—red for low power, yellow for midpoint reached, and green for fully charged. Integrated logic builds on discovery logic and allows the user to take action on a specific point of failure. If a product you want is currently out of stock, the Add to Cart or Buy button is replaced with a Notify Me button that sets a reminder in the system. Predictive (proactive) logic works with certain thresholds or past and current data points, when available. In this case, the next outcome becomes a predictive scenario, where you receive a timely warning for preventive and corrective action (sometimes in the form of an augmenting suggestion) that can be turned into action. Although this is not an exhaustive list of examples, these are some of the key considerations that we, as design thinkers, must consider. The more we understand different types of integration, the more we can create opportunities to deliver customer-centric solutions designed with empathy. By exploring diverse points of integration, we learn more about the core value-delivery system that eliminates biased, distorted, and partial design flaws and helps us create user-centric products and services built on integrated solutions.